This loft apartment in a former tank station in the Austrian city of Salzburg features a sweeping concrete staircase and a glass shower cubicle that cantilevers over the living space. The Panzerhalle is an industrial brick shed in the city's Maxglan district that previously housed a workshop for military vehicles. 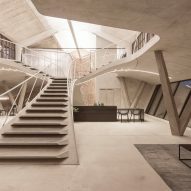 The building has been converted into a multipurpose venue housing a market hall, restaurant, spa facility and two co-working spaces. Vienna studio Smartvoll was appointed following an international competition to oversee the design of an apartment that occupies the building's 350-square-metre roof space. 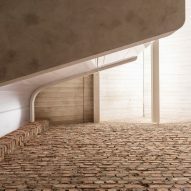 The architects sought to retain the overall volume of the space, along with details including the historic brick walls, while introducing dramatic elements that lend it a distinctly modern feel. "We wanted to revitalise the space's original charm," said Smartvoll. "Magnanimity and a spatial experience of both storeys were priorities – in all dimensions." Intent on filling the interior with natural light, the architects kept internal partitions to a minimum and incorporated a gallery level that overlooks the main living areas. Daylight entering through clerestory windows reaches both levels and the minimal balustrades lining the gallery ensure uninterrupted views between the two floors. Private spaces including two bedrooms, a bathroom and lounge are positioned around the perimeter of the ribbon-like gallery. 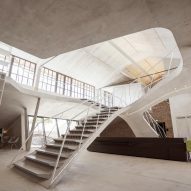 Concrete plays an important role throughout the refurbishment, as the main material for the flooring, ceilings and core structural interventions, including the central staircase. This smoothly cast structure ascends from both ends of the space to form a roof over a kitchen designed around a seven-metre counter with space for growing herbs. 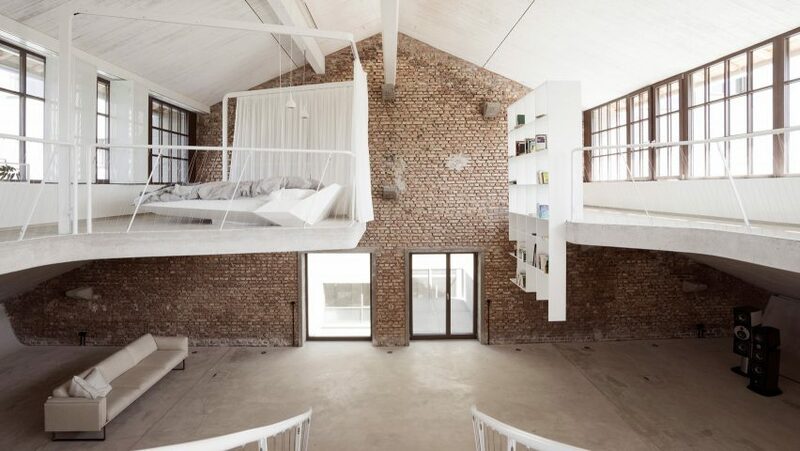 From a central landing, the staircase branches out on either side so it also appears to support the upper floor. 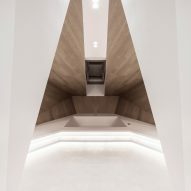 "Through the stair sculpture, which spans across the rooms, you do not see the way between the levels as a vertical, functional connection, but rather as an electric spatial experience," said the architects. On one side of the upper floor, a bathroom lined with windows also incorporates a fully glazed rain shower that projects out over the living area at a height of five metres. Surfaces on this level utilise semi-transparent materials that allow natural light to filter through. The master bedroom can be concealed behind a white curtain, while the guest room is lined with translucent annealed glass. Fitted furniture throughout the interior enhances the feeling of the entire space being constructed as a seamless sculpted unit. 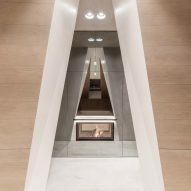 "Connections of space and view are being held intact and the room is not cut into different bodies, but can be experienced perfectly with its height of eight metres," said Smartvoll. On either side of the kitchen, the angled walls accommodate windows that open onto balconies overlooking the surrounding cityscape. One of these outdoor spaces is described as a "zen garden" that incorporates a curvaceous planter containing a jasmine tree. 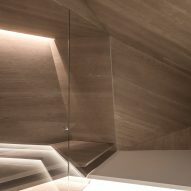 Next to the entrance, a spa area featuring angular timber-lined walls contains a large bath set into a stepped surface, with a shower and compact sauna positioned on either side. Photography is by Tobias Colz.